Bean seeds are one of the easiest seeds to plant because they are large. Bean plants also grow readily without extensive effort by a gardener. Whether you choose a standard bush or pole bean variety or one of the many lesser-known varieties, grow a bean plant for an interesting gardening lesson for people of all ages. Fill the container to the top with potting soil. Plant the bean seed under 1 inch of soil. Water the newly planted bean lightly with water and keep the soil evenly moist during the germination process. Keep the container with the bean seed in a location that stays at least 55 degrees F.
After the seed has sprouted, place the container under the grow light or in direct sun for at least six hours each day. 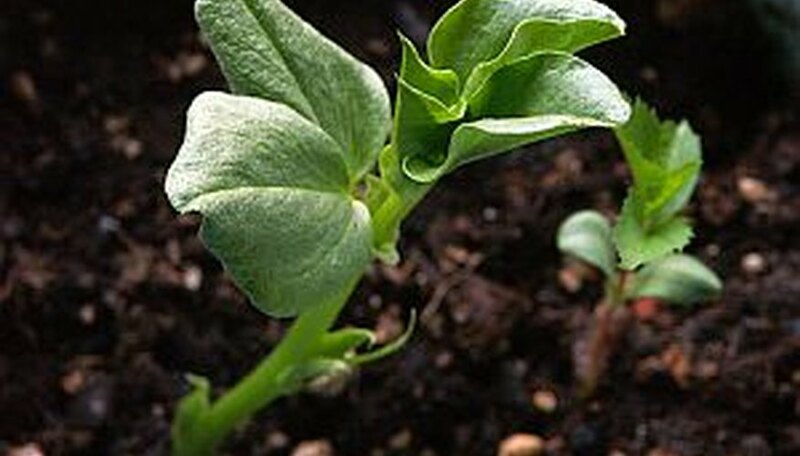 Fertilize the bean plant after the plant blooms and beans form. Consult the package for recommended amounts for the size of container you are using. Continue to water the bean plant and provide at least six hours of light each day. Harvest beans from your bean plant when the beans are the same diameter as a pencil. Carefully snap the beans from the bean plant without damaging the plant as you do so. If a pole bean is desired instead of a bush bean, insert a 3/8-inch diameter dowel into the potting soil when you plant the seed. Use a dowel that is at least 2 feet long and insert the dowel down to the bottom of the container to provide adequate support for the bean plant. Use twine to loosely tie the bean plant to the stake as it grows in the container.